After our first evening in Tuscany I woke up early, eager to see more of the area. So early, in fact, that I managed to squeeze in a decent run and a swim before breakfast. 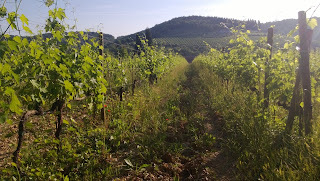 I have become rather fond of running in wine producing areas - you can access areas on foot which are simply inaccessible by car - especially in the morning whilst the plants are still shaking off the cool humidity of night. As promised, a brief explanation of the extraordinary vin santo from Castellare. We popped back to the winery in the morning to be shown the vinsantaia (vin santo cellar), pictured below. For those who don't know, vin santo is a sweet wine made from dried grapes. 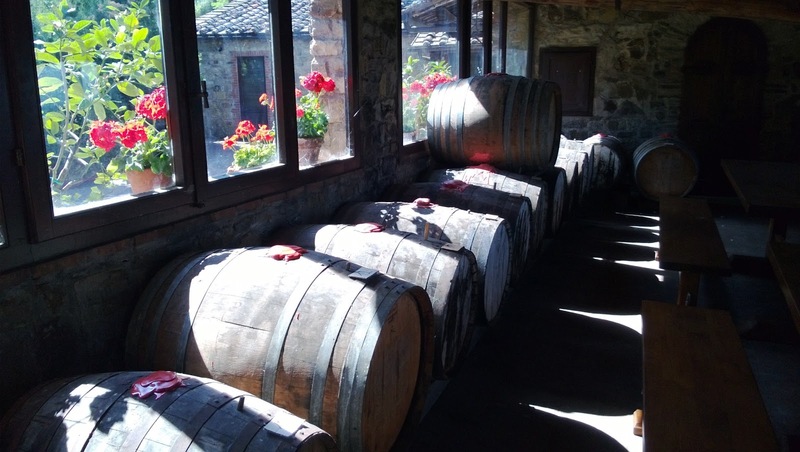 The grapes are picked in August, hung to dry in the room pictured for around five months before being crushed and placed into sealed oak barrels for five years. During that time, there is nothing to do but let nature take its course. Up to ten separate fermentations may take place as the temperatures fluctuate from below freezing to the low 40s with the changing seasons. This is winemaking at its most natural, but also most unpredictable. Sometimes a barrel will be opened and found to be practically empty due to evaporation. The resulting wine is a pale tawny (one to look out for there, WSET students! ), with a pronounced nose of toffee, caramel, coffee, mocha and honey. The palate is out of this world! It delivers everything promised on the nose along with crisp, zesty caramelised orange zest (such as one might expect to find garnishing a Cosmopolitan) and lemon curd. The astonishingly high alcohol (16% abv) is carried easily by the concentrated fruit and acidity present in the wine. Simply put, if you see this wine, buy it. There are only 2,000 half bottles made each year, so it may well be an opportunity which won't repeat itself. Alessandro had one more trick up his sleeve before we left: the cellars. These beautiful rooms, secreted under their 13th century church, housed a 'library' of every vintage since 1979. You can only begin to imagine the prospect of a vertical tasting of the I Sodi wines. Well, actually, you needn't imagine it at all: Robert Parker has done it for you already. This is one of Italy's most highly awarded wine, scoring an average of 94 Parker Points since 1977, peaking with a 97 in 1997. I'm sure you're wondering, so I'll tell you. Yes, I have a bottle. And no, you can't have it. In a super-human effort of will power I'm intending to wait until 2025 before I open it. Wish me luck!